Provider allows us to create and inject a service into configuration phase of our application. For example, If we want to set API key to access the application, we can set the API key via provider and pass the provider to the application while its in config phase. Inject $provide built-in service in config method. Create a provider service by using $provide. Now the “globalSetting” provider is available for all other components. Because it has some properties and methods in a object. How to use Provider in Controller ? 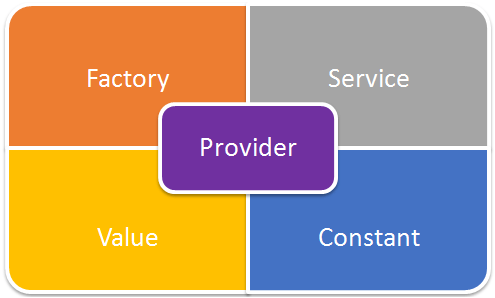 Create a Provider service by using module. 1.Creating provider function through our app Module. 4. Here we set a function for change the app via function parameter. If someone calls this function then the app name will be replace. 5. Return the object literal from this.$get function. So we set a provider function here. How to Inject Custom Provider into .config method and controller ? When we going to inject our custom provider into .config method, we must add “Provider” in suffix of our Custom Provider Name. Now the appname Replaced to “Great App” . We can retrieve the appname into any component.